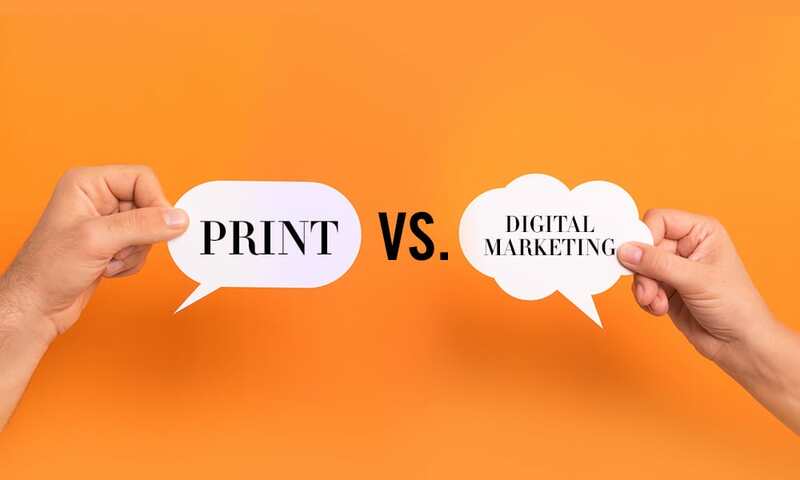 When it comes to marketing your business, there are two main forms that you can choose from: digital and print. Both are proven to be successful but are very different in strategy and campaign tactics. Typically, companies who are intentional in making digital and print marketing coexist are the ones with the most successful marketing campaigns! Here is a breakdown of each form of marketing and how you could use it for your company. Digital marketing, in the simplest of terms, is a form of promoting and selling brands or products using digital technology, such as the internet, television, or mobile phones. There are multiple types of digital marketing, but the most common ones are social media, SEM/SEO, targeted ads, and newsletters. Digital marketing is effective because it allows businesses and advertisers to quickly and directly reach their audience and prospective customers wherever they may be. In this day and age of technology, consumers see more ads in their daily lives than ever before, even if they don’t realize it. Many digital ads are targeted towards a specific audience, which means consumers will see advertisements that they are interested in and relevant to them. Most of the time when a user views a digital advertisement on their social media feed or search results, they might not even notice that there was an ad to begin with. Because the digital world is advancing rapidly, online marketing has to grow just as quickly. Digital marketers are always researching new trends, learning new algorithms, and trying new strategies to get ahead of their competitors. It’s basically a game, and if a company is growing because of their digital marketing strategy, they’re winning! Businesses can easily benefit from digital advertising for multiple reasons. First, it has relatively low costs to produce content and advertise online, thus the return on investment is relatively quick. Second, it’s easy to test and alter marketing strategy and campaigns. If an idea wasn’t as successful as the advertiser had hoped, it’s easy to try again with a new tactic. Lastly, users are continually being exposed to ads, some of which may already be targeted towards them. Print marketing is a form of advertising that uses printed media, such as magazines, brochures, business cards, banners, direct mail postcards, or catalogs. Before digital marketing ever existed, print marketing ruled the advertising industry. It’s the original form of marketing, and it hasn’t lost its effectiveness. With print marketing, advertisers and business can still reach their target audiences, but it happens a little differently than it would digitally. For example, if a tourist-attraction company wants print advertising, they don’t just think about who their target audience is; they think about where their audience will be physically and what they are most likely going to be reading. The tourist-attraction company will most likely be sharing some business cards or brochures at a nearby motel or hotel. Print marketing has the upper hand when it comes to sensory and memorability. Research shows that the more senses someone uses in a given time, the more likely they will remember it later on. This is because different senses activate different parts of the brain, so being able to look at an ad while tangibly touching it allows the person to engage with and remember the ad more. For example, magazine perfume samples are there for more than just to let the audience know what it smells like; it’s also there to help them remember the ad and brand! People also find print marketing to be more trustworthy. This is because generally speaking, print media has to go through extensive editing and proofing before it goes out to the public. When looking at a business card, most people won’t doubt the information on the card and trust it to be accurate. Here at IDG Advertising, we believe both print and digital marketing is necessary to ensure your company’s growth and enhance your brand. Both serve a similar purpose (aka promote your brand), but they do so with different intent. Digital intends to have quicker results while print intends to be more memorable. The two should coexist with one another to maximize your marketing strategy! If you are in search of someone to help you with your digital and print marketing, don’t hesitate to reach out! We’d love to hear from you and happy to help you out with all your print and digital marketing needs.